At the risk of jinxing myself, not just because it is week thirteen, I decided to gasp admit to reading two books this week. Which, if you’re following me on Goodreads you’ll know is not the case at all. I’m considerably ahead of pace to read 52 books in 52 weeks, so I’ve decided (and here’s the jinx) I’ll double up here and there. So here we are. A book that encourages you to give no (or few, he contradicts himself a few times) fucks, and a book that seems to argue that, in America at least, too many fucks are given about what we do with our bodies after we die. So they’re sort of similar. A lot of people found the Manson book rather meh, or thought that it started well and then went downhill. I too found it meh overall, but I started out really disliking it and found that it got better later when Manson dropped (or forgot to so fervently continue) with the crass too cool dude thing. I did have a couple personal a-ha moments in the book, I’ll admit without getting into details. But I also picked this up during the height of my newfound no-fucks-given sobriety, and I still believe that if you really want to learn to give no fucks then try giving up drinking. I picked up the Doughty book and do not know why I decided to read it before her earlier Smoke Gets in Your Eyes that was also on my to-read list. I say was because I’m no longer sure. From Here to Eternity was an easy, entertaining read but I went into it wanting more substance, à la Mary Roach’s Stiff, which, admittedly, I read quite some time ago and may over-romanticize. I wanted Eternity to have more meat on its bones. It was good, but I think could have been better. Worth reading though. My (fingers crossed) final physiotherapy appointment came and went on Wednesday. We talked about the tools I now have to take better care of myself and about my missing Alex Hutchinson’s talk at Forerunners and his new book Endure, which is now on my to-read pile, and the lab-tested notion that smiling makes you run faster. And I’ve thought about that a lot, especially that my favourite races, the races that I remember having the most fun running, turned into personal bests. 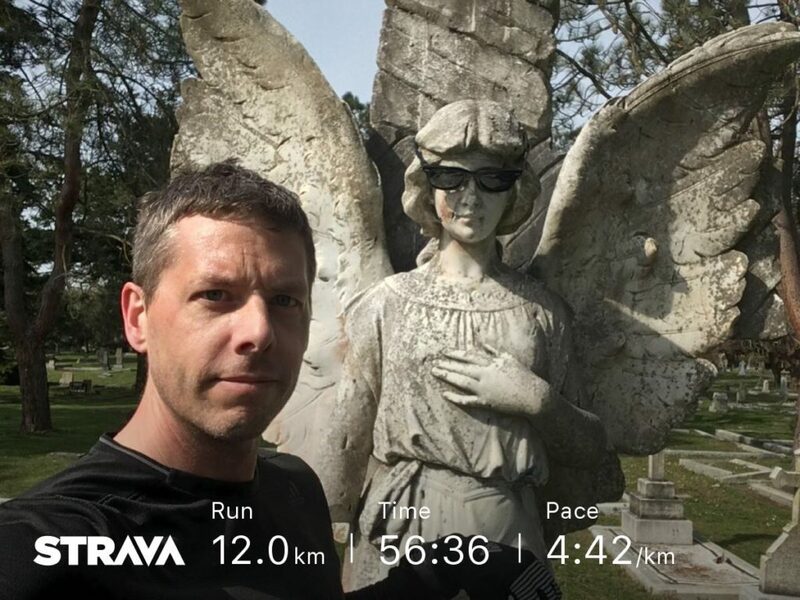 I spent the Easter long weekend in Oak Bay on Vancouver Island running into hills and headwinds and in my head not worrying about my meniscus. Not exactly smiling, but staying in the moment and enjoying running for running’s sake. Maybe the smiling will come.